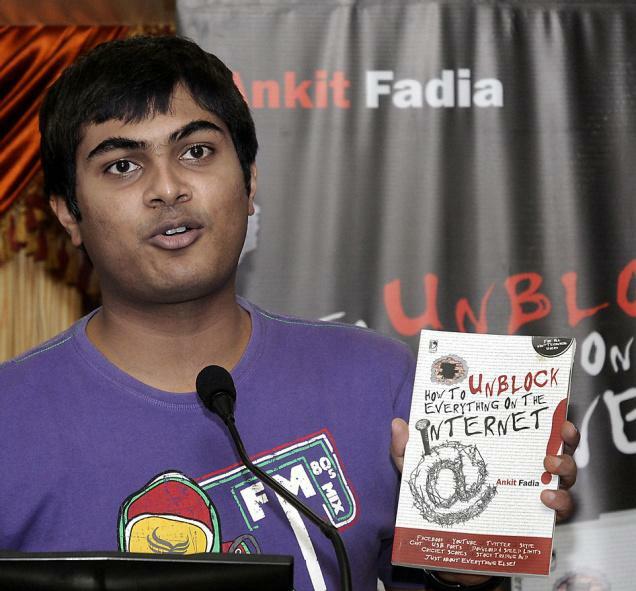 Ankit Farida author of the book 'How to unlock everything on the internet" released the book ,in Hyderabad on Tuesday. - Photo G. Krishnaswamy. Ask Mr Ankit Fadia, the 26-year-old ethical hacker, to sign his book for you, he would scribble ‘Happy Hacking’ before signing it. For him, hacking is ethical and a tool to settle scores if someone restricts your freedom. He feels that it is like arming the disarmed. If Government or any private or public agency tries to restrict Internet access, Mr Ankit says, “you need not lose heart. You need not keep mum and suffer silently.” It is an antidote for censorship, which he feels, not fair. “You can always press ‘undo’ button in such cases and enjoy surfing whatever way you and get connected with the world,” Mr Ankit, who wrote his book when he was 14, said. He is part of E-Secure, a security consultancy firm that hacks into companies’ networks (after it is engaged for the job) to highlight the chinks in the armour. The firm has advised 50 companies so far. In Hyderabad on Tuesday to promote his latest book How to unblock everything on the Internet, there is nothing on the Internet that can be blocked. The book, his 15th one till date, contains information on how to unblock the blocked sites. Referring to recent moves by the Government to force social networking sites to pre-screen the content before it gets published, he said cyber laws would do to tackle unlawful activities. “Putting restrictions on sensitive information is okay. I am against all other restrictions. You can always pull up the wrong guy and put him to task,” he said. Ethical hacking could be a good career option. “There are good guys and bad boys out there. Knowledge is like a knife, it all depends on how you use it,” he said.